Over the last year, our own Junior Girl Tia Shah, has been writing an amazing column about trailblazing girls throughout history. This new Incredible Girls column is in that vein, only this column is about contemporary girls under the age of 25 who are doing awe-inspiring and significant things in the world. Every Friday in 2019, we are going to post a column detailing the life of an Incredible Girl and why you should know about her. Read on for a glimpse into the life of Camryn Green. 14-year-old Camryn Green is in 9th grade and from Raleigh, North Carolina. She also just happens to be a budding entrepreneur and successful artist who also gives back to charity, organizing scholarships and backpack drives for children in Liberia. According to her website, Camryn donates 15 percent of her profits to scholarships for Liberian orphans and an annual backpack drive. She started her artistic endeavors early, and was painting by the age of 4. 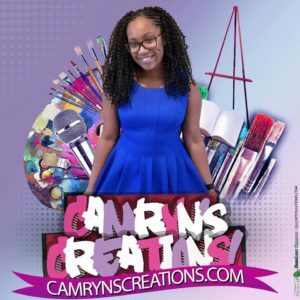 When Camryn was 8, her mother set up a Facebook page and they started receiving orders for Camryn’s art, so they founded Camryn’s Creations. Thus far, she has sold over 500 paintings, written a children’s book and has become an accomplished youth speaker. In an interview with The News & Observer, she said that she was inspired to start sponsoring children in Liberia after a friend’s mom, who was from Liberia, told her about children’s lives there. She sells her artwork anywhere from $20 to $100, and she told the newspaper that she is putting some money away for college, art supplies, and business expenses, and the rest toward a scholarship fund for orphans in Liberia who can’t afford to go to school. As far as advice for other young entrepreneurs, Camryn had this to say: “Set a goal for yourself first. I set a goal to make at least 10 paintings. I was 8; I didn’t know much about it. Work hard, be consistent with it, and don’t give up on your dreams.” She said that her business has also taught her how to work hard and consistently, to manage her business. And even when she doesn’t feel like painting, she does it anyway because she thinks about how much she has been able to give back to her community. We don’t have to wait to be adults to make a difference, indeed. If this column over the course of 2019 dives into nothing else, it will be that — girls and young women are making a positive difference all over the world and are not waiting for permission to do so. And that thought…is really reassuring and magical.